I have a confession to make. I’m not really into the whole mint and chocolate combination. I’ve never disliked it, exactly, but it’s never been one of those things I crave. Mint chocolate chip has always been my father’s favorite flavor of ice cream, but ever since I was a kid, I could take it or leave it. And, don’t hate me, I’m lukewarm on York Peppermint Patties, too. And while, I, like just about everyone else I know can inhale a sleeve of Thin Mints, I was always more likely to break into a box of Tagalongs or Samoas or even the less popular but addictively salty Do-Si-Dos. I feel like that makes me sound incredibly unfun. But wait! Don’t give up on me yet. I’ve found a place where I don’t just tolerate the combination, but where I actively seek it out. In fact, it’s one of my favorite sorbets ever. I used to think sorbets should stick to fruit flavors and that flavors like chocolate were merely pale imitations of ice cream intended to appease the low-fat crowd. 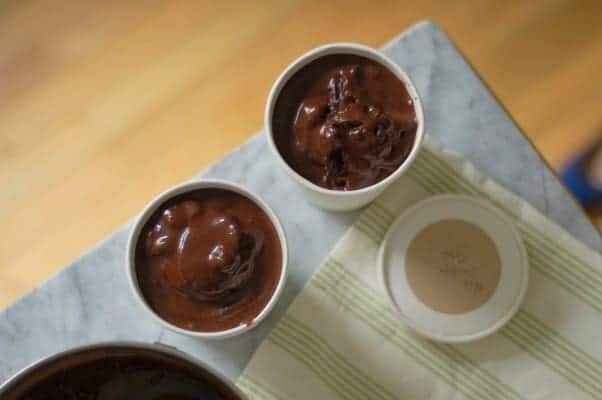 But this mint chocolate sorbet, which is my spin on David Lebovitz’s chocolate sorbet from his excellent ice cream book, The Perfect Scoop, feels every bit as satisfying as a chocolate ice cream. 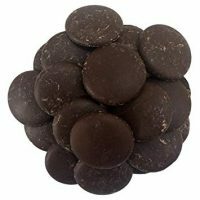 In fact, it feels deeper and more intensely chocolatey, because there’s no dairy to blunt the chocolate flavor. It gets its intensity from both cocoa powder and bittersweet chocolate and, I think this is key, it gets its mint flavor from real fresh mint leaves. There’s no artificial mint extract to be found here. The flavor is natural and light and refreshing. The mint leaves go into a pot with some water and sugar and glucose syrup (optional, but helps the texture) which is brought to a boil to dissolve the sugar and then covered and removed from the heat to steep for 20 minutes. Then the mint gets strained out, the cocoa powder gets whisked in, and it goes back to a boil to bloom the cocoa powder to bring out it’s flavor. Then that all gets poured over chopped bittersweet chocolate, which gets all melty and then gets stirred in. Then the whole thing goes into the refrigerator to chill down overnight. The next day it gets processed in an ice cream maker. 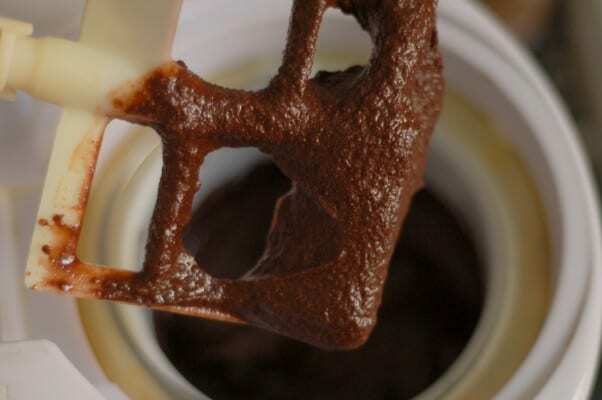 If you don’t have an ice cream maker, you could pour the chilled mixture over ice for a fantastic cold chocolate drink (like hot chocolate, but for the summertime). After it’s processed, the sorbet gets packed into containers and goes into the freezer. And then, well, then, it gets eaten. 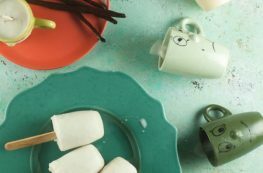 Looking for other chocolatey frozen treats? 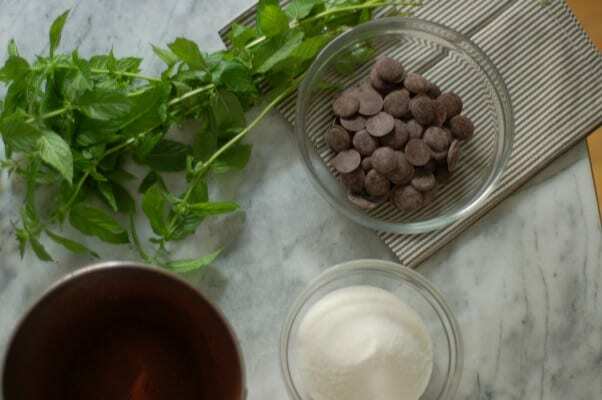 Try this cocoa nib semifreddo. 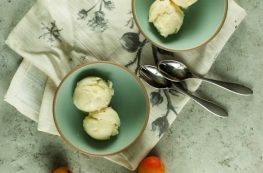 It’s basically a no-churn ice cream that tastes like a grown-up frosty. Or these nostalgia-drenched classic ice cream sandwiches. This mint chocolate sorbet made me come around on the mint chocolate flavor pairing. It’s dark and intensely chocolatey. The fresh mint keeps the flavor natural. You can use either semisweet or bittersweet chocolate. I usually use bittersweet, which is the darker of the two. If you like things on the sweeter side, go with semisweet chocolate here. I like to use glucose syrup in my sorbets to help keep them a bit softer and more scoopable. 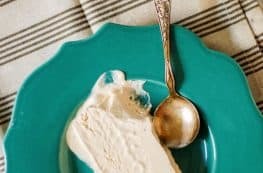 You can substitute corn syrup (I don’t think it’s evil when used in moderation in the occasional homemade dessert) or you can replace it with the same amount of sugar. Be sure to chill the mixture down until it’s very cold (it won’t freeze properly in the ice cream maker if it isn’t at or below 40ºF). If you don’t want to wait till the next day to have your sorbet, you can speed up the chilling process by pouring the mixture into a zip top bag and submerging it in an ice bath. It should be cold enough to process after about 30 minutes. In a medium saucepan add the sugar and the mint leaves. Gently press the mint leaves into the sugar to help extract the oils. Add 1 1/2 cups (375 ml) of the water and all of the glucose or corn syrup and salt. Bring to a boil, stirring frequently, until the sugar is dissolved. Remove from heat, cover, and let steep for about 20 minutes. Strain out the mint leaves and discard. 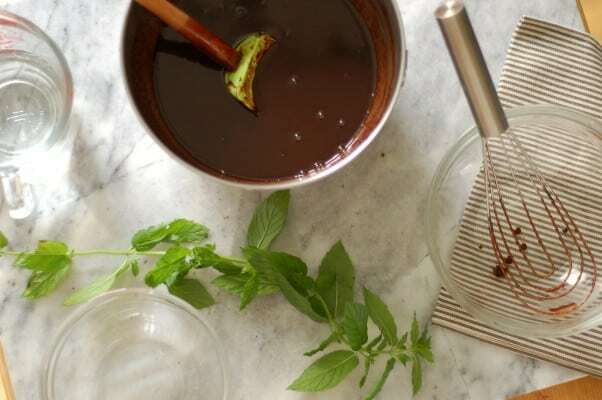 Return the mint syrup mixture to the saucepan, add the cocoa powder, and whisk to combine. Bring to a boil, stirring frequently. Once it reaches a boil, keep it boiling for about 1 minute, stirring all the while. Remove from heat. Place the chocolate pieces in a heat proof bowl. 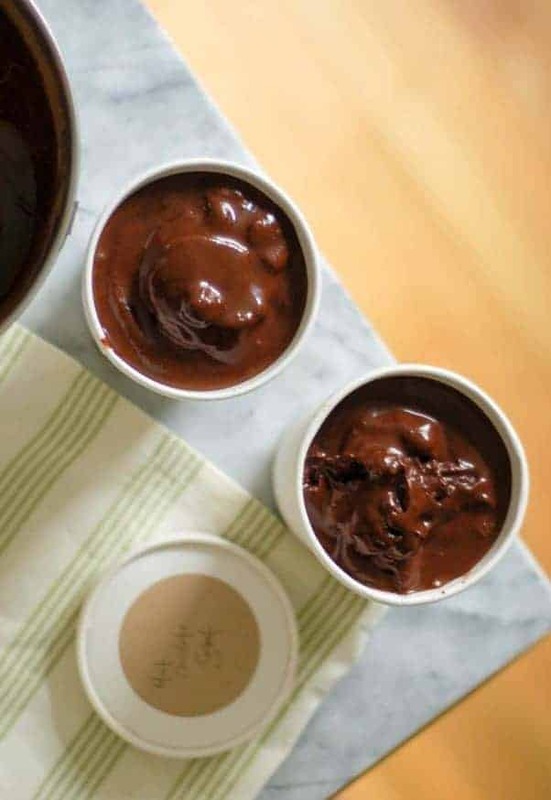 Pour the mint and cocoa mixture over the chocolate and let sit for a few minutes to melt the chocolate, then whisk until the chocolate is thoroughly melted and mixed in. Stir in the remaining 3/4 cup (180 ml) water and the vanilla extract. Chill the mixture overnight (or pour the mixture into a zip top bag and submerge in an ice bath for 30 minutes), until it reaches 40°F or below. Sometimes the mixture develops a thick layer on the top as it chills overnight–just whisk it in before you add it to the ice cream maker. 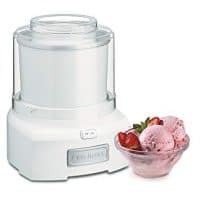 Process in an ice cream maker.